Greetings from Brooklyn! The site has been slightly quiet these days, and for good reason. I’m currently working on a new album which should see the light of day this fall. I’m also developing another addition to the Starving Artist’s Guide Series, all while still trying to promote and market the first book which was published last October. There will indeed be a podcast put up very shortly for those of you who want to hear what I’ve been up to. It’s been a very intense summer thus far, with some great shows in NYC, such as the Arcade Fire show I attended this last Thursday. I’ve been spending most of my time outdoors, riding my bike and enjoying the weather. Midway through the summer my landlord pulled my air conditioner right out of the wall in my room because it was leaking and creating a problem for the downstairs tenant. As such, I’ve been totally A/C free since the middle of July. Honestly, it’s cut down significantly on my electricity bill, caused me to take more showers and also made me enjoy my porch a lot more than I ever have before. I also have been tending an intense green thumb habit, which is pretty zen when it comes down to it. I harvested a good deal of carrots and tomatoes already, and just planted a batch of green beans, which I hope will produce some delicious edibles this fall. In other news, I bought a moped off of craigslist.com for $250! It’s a 2005 Yamaha 50cc. It’s been in the shop for a little while, but hopefully it’s gonna be great for fall rides. 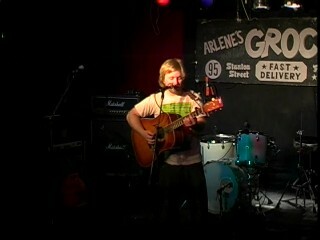 Here’s a link to a show I did at Arlene’s Grocery this Spring. It’s got some songs that will be on the upcoming album.